In his sixth pictorial essay of road construction in the mid 1900s, Browning celebrates the 75th anniversary celebration of one highway in one state, the Pennsylvania Turnpike. Chapters illustrate the construction of the initial 160 miles from 1938 through 1940; the four extensions built in the 1940s and 1950s; and the 1960s improvements to bypass two tunnels and add three more. 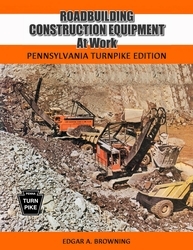 Using primarily images from the Pennsylvania State Archives, the author shows all stages of construction, and a strong representation of the tremendous variety of equipment used in each stage. Softbound, 148 pages, 6 color and over 170 B&W photos.